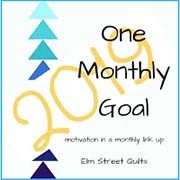 My January OMG (One Monthly Goal) was to stablilize the Leavenworth quilt in preparation for free motion quilting. For my February OMG, I plan to carryover the Leavenworth quilt, and hope to complete the free motion quilting on it. I don’t have a plan for the free motion quilting, but I have begun. Beginning is half the battle! It is time to report progress on my January OMG (One Monthly Goal). My goal was to machine stitch in the ditch to stablilize the quilt for free motion quilting.